For a season and a half, Kansas City Royals fans were subjected to the fall-down range and errant arm of Yuniesky Betancourt at shortstop. Hoppers hit to his left were all but guaranteed base hits, and booted would-be double play balls gave opponents extra chances to pummel the pitching staff. Those defensive woes were supposed to end in 2011 with Alcides Escobar, picked up from the Brewers as part of the Zack Greinke mega-deal, taking over at short for the Royals. Escobar, a former top 20 prospect who Baseball America said “was born to play shortstop,” has been as good as advertised with the glove. Unfortunately, his bat has been so bad that it has wiped out the value provided by his exquisite range, body control and cannon arm. 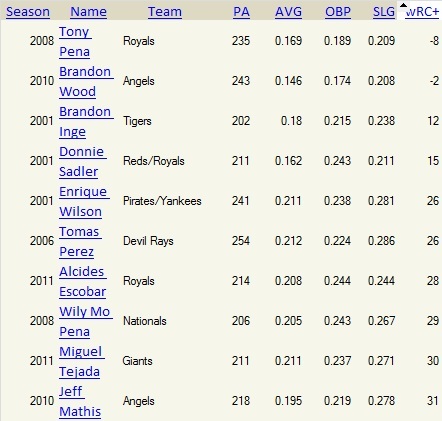 Pick a defensive metric, and the 24-year-old Escobar ranks near the top of the leader boards. By Ultimate Zone Rating, K.C.’s new shortstop has saved +5.4 runs compared to an average player at his position. That places him in the top 10 among all major leaguers and first among shortstops. The Fielding Bible’s Plus/Minus system has Escobar tied for the MLB lead with +9 runs saved. While the Fielding Bible data shows him making a few less plays than the average shortstop on balls hit to his left, Escobar has a +14 play rating on balls hit to his right. Take last night’s contest with the Twins, for instance. Minnesota’s Alexi Casilla hit a Joakim Soria curveball deep in the hole at shortstop in the eighth inning. Escobar backed up to the lip of the infield dirt, barehanded the ball and made an accurate, near-side-arm throw with both feet planted that popped Eric Hosmer’s glove at first base. He’s a joy to watch in the field. When Escobar comes to the dish, however, you might want to shield your eyes. His triple-slash this season is .208/.244/.244 in 214 plate appearances. For reference, Greinke has a .176/.200/.412 line in 38 career PA. Greinke has out homered Escobar this year, 1-0. With -16.8 Batting Runs, Escobar has done more damage to his team’s run-scoring chances than any other hitter in the game. Despite Escobar’s breath-taking D at a premium position, his historically inept bat has made him a sub-replacement level player: he has -0.3 WAR in 2011. It would be nearly impossible for him not to show offensive improvement moving forward: ZiPS projects Escobar to hit .252/.295/.334 during for the rest of the season, with his batting average on balls in play rising to the mid-.280s from its current .240-ish mark. Given the lower run-scoring environment, that batting line coupled with sublime defense would make Escobar a decent starter. If Escobar hits something close to that ZiPS projection while posting excellent defensive numbers (if not quite the otherworldly figures so far), he would be roughly a two-win player. Don’t expect to see Escobar on a mound like Pena Jr. anytime soon — Escobar’s glove and youth make him a potential building block for the Royals. That said, he’s going to have to outhit Greinke and stop keeping offensive company with the Donnie Sadlers and Enrique Wilsons of the world to provide value in Kansas City. We hoped you liked reading Alcides Escobar: Golden Glove, Brutal Bat by David Golebiewski! Why the Long Ball, Bronson? A recent graduate of Duquesne University, David Golebiewski is a contributing writer for Fangraphs, The Pittsburgh Sports Report and Baseball Analytics. His work for Inside Edge Scouting Services has appeared on ESPN.com and Yahoo.com, and he was a fantasy baseball columnist for Rotoworld from 2009-2010. He recently contributed an article on Mike Stanton's slugging to The Hardball Times Annual 2012. Contact David at david.golebiewski@gmail.com and check out his work at Journalist For Hire.